Of course, anyone with a brain knows that we should limit our time in the sun (but for heaven's sake - get out there and get some vitamin D - those of us in the NW know just how precious it is), stay hydrated, cover-up, and use sunscreen, but with so many products out there, which ones are best, which ones truly work, and which ones should be avoided at all cost? Plus, which ones are easy to find and affordable? I have yet to find a sunscreen that meets every criteria. The organic mineral varieties tend to be chalky or gritty and don't rub into the skin well, so at the end of the day, you find yourself covered in a sticky dusting of grainy powder. Bleck! Last season I tried Burt's Bees, Alba, Jason and finally became frustrated and settled on Neutrogena Pure & Free Baby sunblock (which earned a fairly decent score from EWG last season, but is now on the list of "high toxicity" products because of the ingredient retinyl palmitate/Vitamin A - insert expletive here). Probably the best place I've found to get good/current information on sunscreens (and a lot more) is the Environmental Working Group. Their 2011 Sunscreen Guide provides information about myths surrounding sunscreens (I was most surprised by this one: "Recently available data from an FDA study indicate that a form of vitamin A, retinyl palmitate, when applied to the skin in the presence of sunlight, may speed the development of skin tumors and lesions (NTP 2009). This evidence is troubling because the sunscreen industry adds vitamin A to 30 percent of all sunscreens"), sun safety, and best sunscreen products. I'm a big fan of their Hall of Shame. Hard to believe so many baby sunblocks are so very, very bad. The best sunscreens (outside of the mineral types) are those that contain zinc or titanium. These provide the best UVA protection w/out causing chemical hormone disruption. They should not contain oxybenzone or Vitamin A and should not be in powder or spray-on form, since those are more easily absorbed into the skin. Mineral sunscreens always get the highest ratings (but, as I said before, I have yet to find one that actually blends...they seem to have the consistency of peanut butter that has been left to sit out for several hours). Personally, I would rather not wear sunscreen than wear mineral. 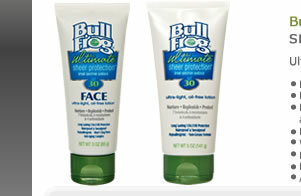 To see the list of the top 153 sunscreens - click here. I don't want to waste a ton of money looking, ordering, testing, and throwing away, so I plan to give the following products a try (they seem to fit the bill for "low toxicity", affordability, and accessibility). There doesn't seem to be a "perfect" sunscreen out there...so these are the next best thing - for now. Further research unfolds the problems/risks with these options...so now, it's making a decision about which risks are acceptable. The winner is BULLFROG. Who knew? Now, if you are one of those who are cool with the mineral stuff - I've heard that Badger is the best. Alba, Aubrey Organics, Jason, Nature's Gate, Kiss My Face, and Earth's Best are fairly easy to find around the peninsula. All of these tend to be pricey...but then, I suppose our skin is worth it. Phew! It took me roughly 2 hours to complete this post, research included. I visited 23 different websites to whittle it down to the most accurate information. So, there you have it: one question (what sunblock should I go an buy this afternoon? ), hours of research, and one answer (Bullfrog). The annoying thing about all of this is, as I have learned, that once you have narrowed it down to a product, it doesn't mean that every product in that brand meet the same criteria...so more research has to be done with every single item within a product name. Sometimes I hate that I care.